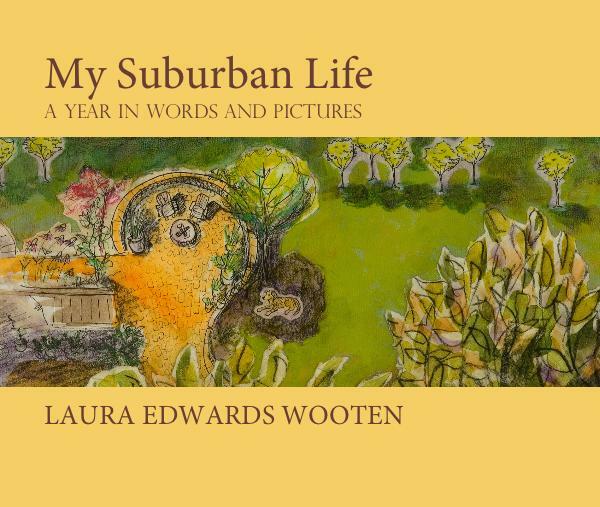 I am thrilled to announce that my new book, My Suburban Life: A Year in Words and Pictures, is now available for sale at the Blurb online bookstore! The book includes edited text from the entire year of blog posts chronicling my collage-a-week project, including the final Reflections essay, as well as professionally photographed, high quality images of all fifty-two collages. Sketches, drawings, and images of my process are also shared. The book is printed on gorgeous premium paper with a lustre finish that highlights the rich colors and textures of the artwork. It has a hardcover and dust jacket, presented in a large 13″ x 11″ landscape format, perfect for your coffee table! Many thanks to my father-in-law, Deak Wooten, who designed the beautiful page layouts and took me through the process of converting a blog into a book. Thanks Papa! Interested? Please click here to preview the book and purchase your copy! Many thanks to everyone who was able to make it out to The Arts Center in Orange for the exhibition of My Suburban Life: A Year in Collage. 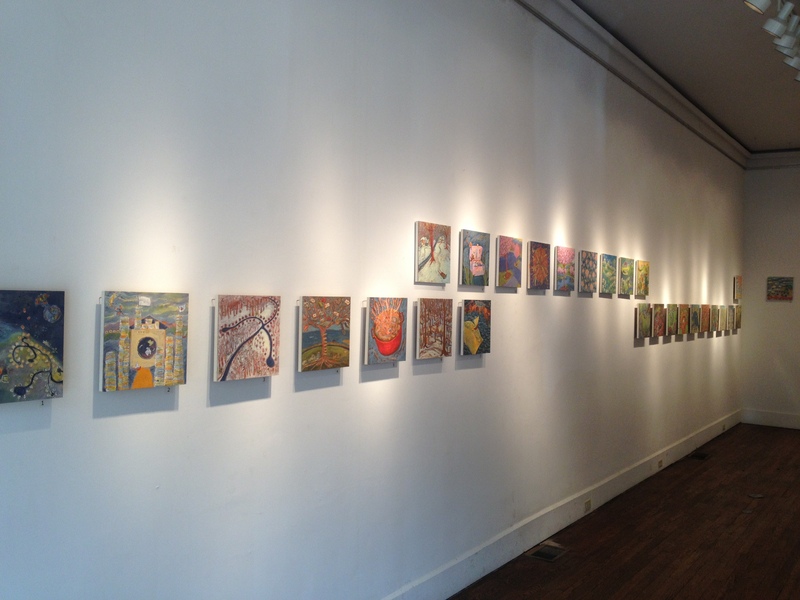 It was so gratifying to see all fifty-two collages hanging together in this lovely space. The Arts Center has been wonderful to work with and I am very grateful for the support of Laura Thompson, the Gallery Director, who invited me to exhibit here. The show was curated by my dear friends and mentors, Pam Black and Theo van Groll, from the UVa School of Architecture. Their vision for the exhibition installation was in perfect keeping with the spirit of the project: a slow linear unfolding over time, with gentle sight-line shifts that reflect the changing of seasons or the delineations that arose naturally through color and theme. The panels were not hung flush to the wall like traditional paintings. 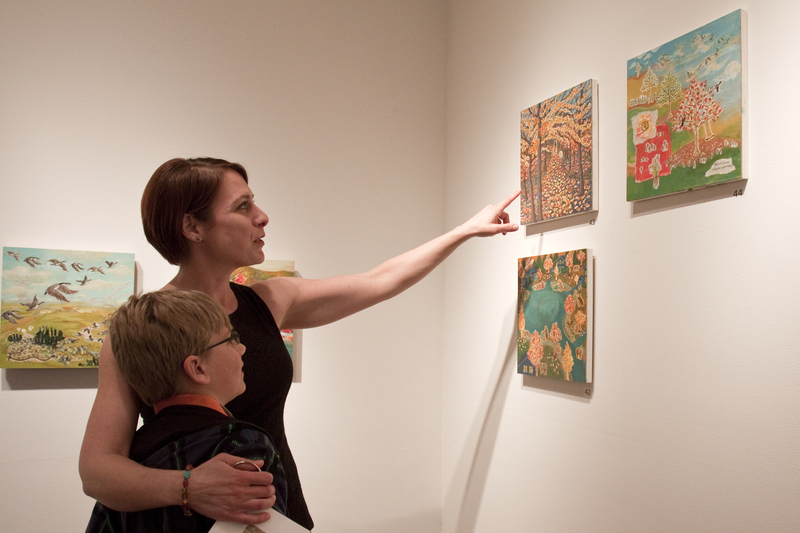 Instead, they were set out from the wall to emphasize the tactile, three-dimensional nature of the collages. 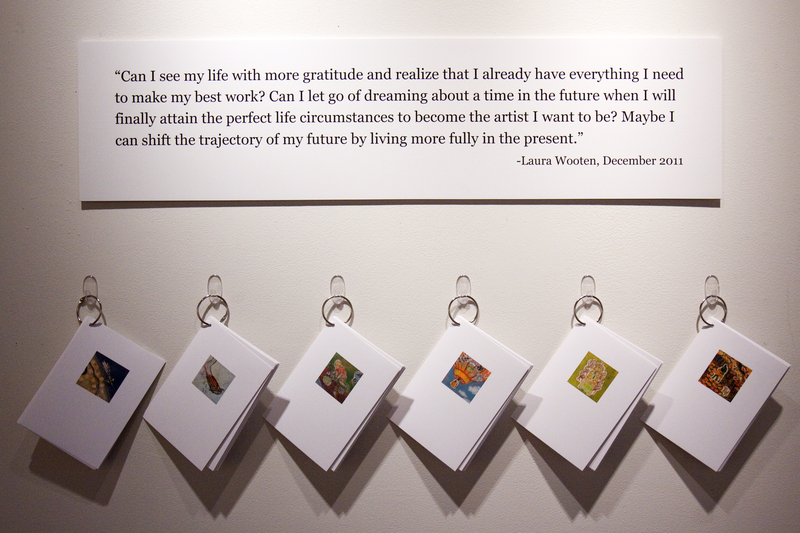 It was important to me to include some text in this exhibition and share the stories behind each collage. The practice of writing each week became such a large part of the project and its process, so I was determined to present the text in way that would highlight the relationship between words and pictures. I experimented with different ways to present the text without interrupting the visual flow of the images on the wall. I decided to create small 5 x 7 cards for each collage. A text excerpt from the accompanying essay for each collage was printed on one side, and a small detail image from the collage was printed on the other. The cards were separated into six groups that corresponded to the linear groupings of the collages on the wall, and were bound with a simple ring in the corner. Gallery visitors were welcomed to read through the cards at their leisure, or carry them around the gallery to read as they viewed the works. I also included an introductory wall-mounted text describing the goals of the project at its inception, and a quote that captured the spirit of My Suburban Life. 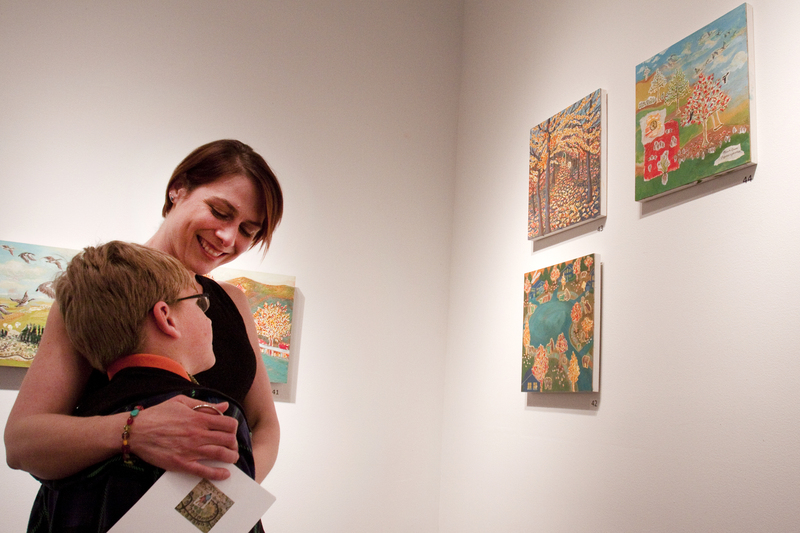 Here are some more photos of the Opening Reception on April 4th. 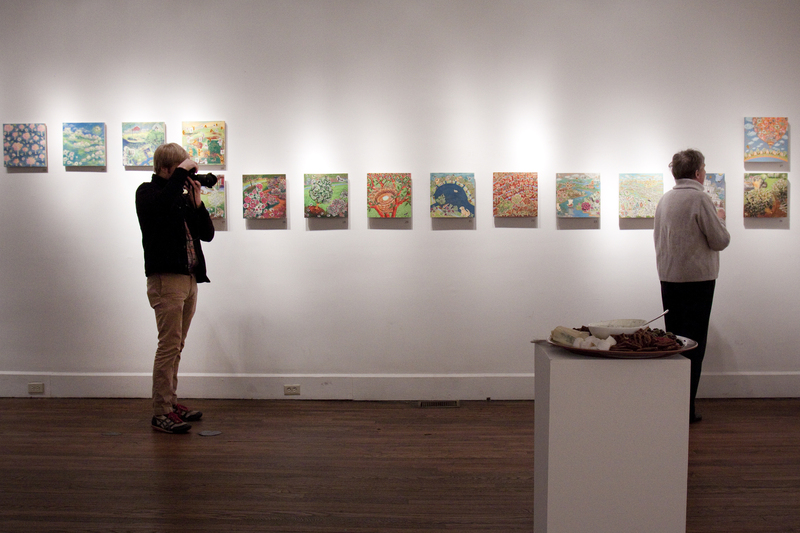 Many thanks to John Strader for documenting the event and generously sharing his photos! Many thanks to The Arts Center in Orange for inviting me to exhibit my yearlong collage project, My Suburban Life. The exhibition will include all 52 collages plus selected text from the accompanying essays that reveal my process, inquiry, and inspiration. 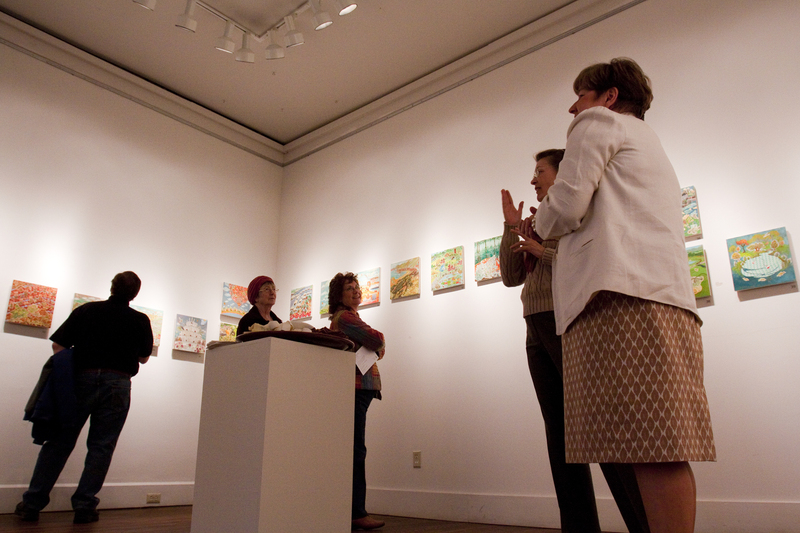 Laura Wooten presents her yearlong project of creating a collage every week for the year of 2012. 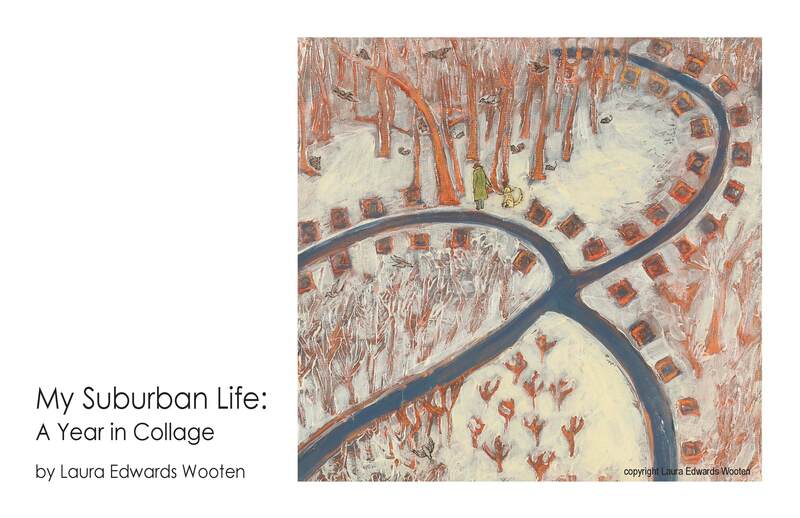 As an artist living in the Virginia suburbs, Wooten seeks to both confront and integrate her multiple identities of artist, wife, mother, and suburbanite. Breaking from her previous body of work, depicting imaginary landscapes, Wooten finds inspiration in the details of her everyday life. 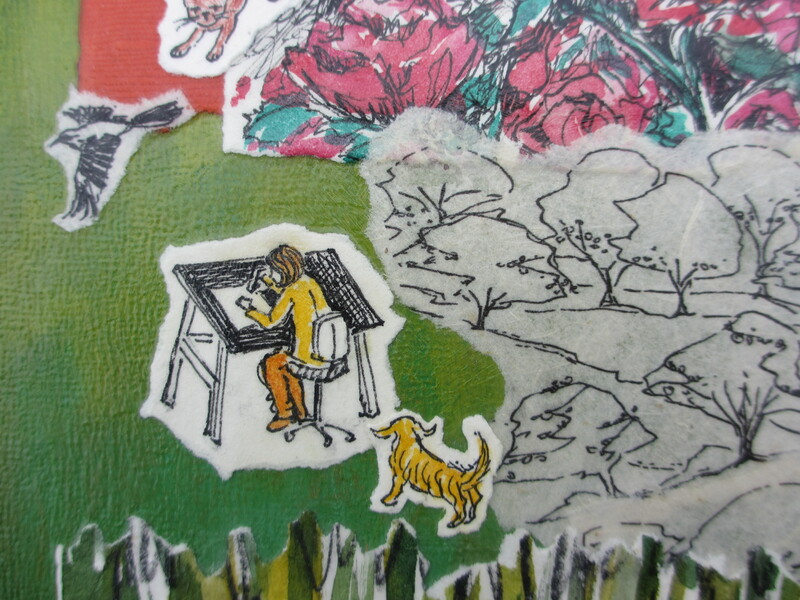 Juggling a busy schedule of art, work and family, the steady practice of making small drawings becomes the foundation for the collages. A commitment to weekly creativity brings a new momentum and spirit of discovery to her work, resulting in a heightened sense of curiosity, gratitude, and the ability to find the extraordinary in the ordinary. This project explores what is achievable in tiny increments over time, by committing to small consistent actions and an attitude of openness to what is here now in the present. My workspace in the studio. Reflecting on my year of weekly collage-making, the one realization that I keep coming back to is this: When I am too tired, too busy, totally lacking in inspiration or over-whelmed with too many ideas at once, I just need to sit down to work, and something will happen. I must simply pick up the pen and move my hand across the page. It’s like turning on a tap and waiting for the water to warm up; it always does. Learning to trust in this process has been the greatest gift to myself. Just begin. Take the first step, then the second, then the third. Baby steps evolve into long strides, then big leaps. At the beginning of 2012 I asked the question, “What is achievable in tiny increments over time?” To answer this question it was necessary to make a commitment to create each week, every week. This process continues for me, and commitment is the foundation. Another important challenge of the project was to open up my subject matter to the real stuff of every day life. 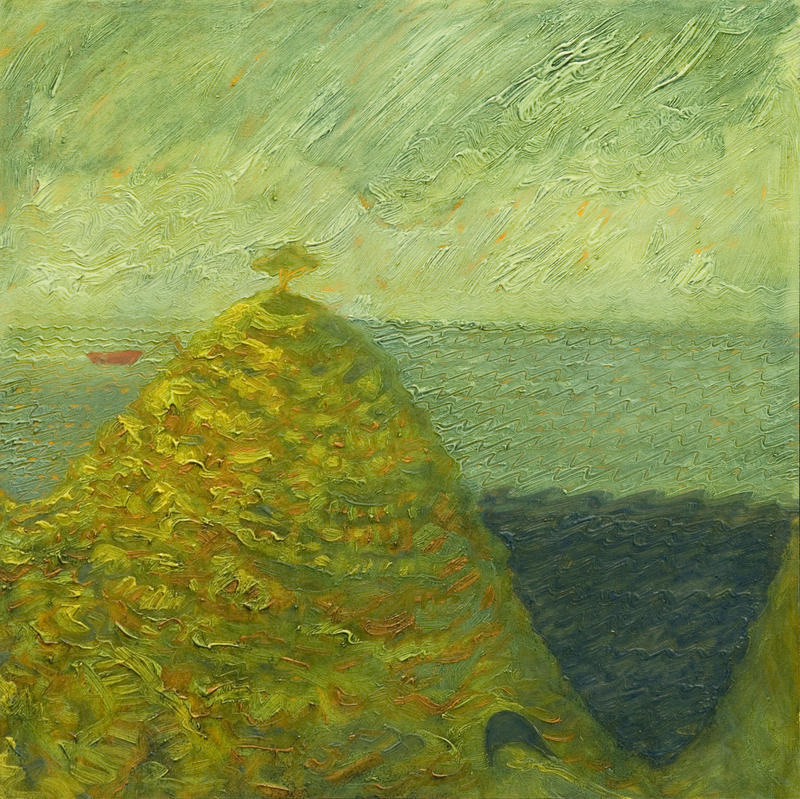 My previous body of work portrayed imaginary landscapes that provided me a kind of escapism. A small boat navigated a world of high seas and safe harbors, open vistas and dark caves, dense forests and lonely islands. 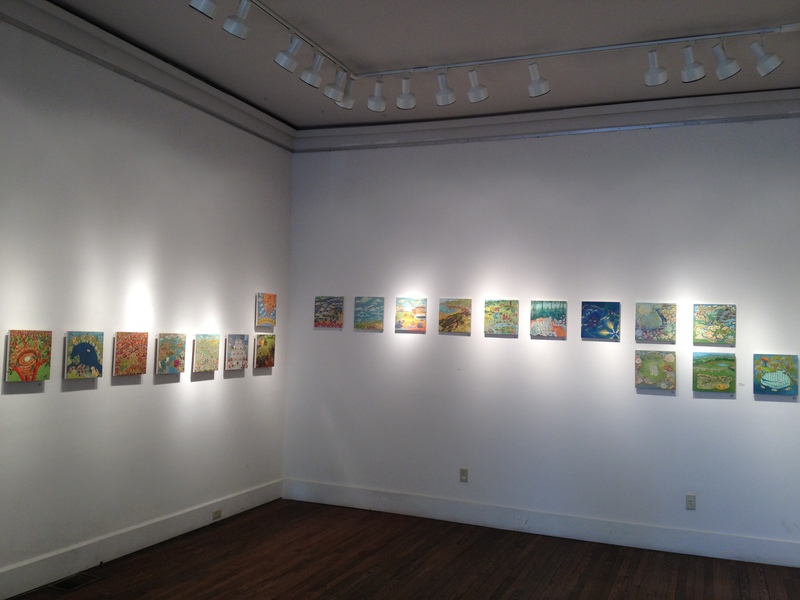 These paintings were my vehicle for exploring different ways of being in the world, and creating visual metaphors for a continuum of emotional needs: the desire for community and solitude, contentment and ambition, safety and risk. In my collage series, I wanted to confront these themes more directly, pulling back the curtain on the imaginary landscape and allowing myself to find imagery directly from the details of everyday life. The imaginary landscapes had no cul-de-sacs and tidy yards, no family members or week night suppers. But this suburban landscape was the reality behind my invented worlds, and their true source of meaning. I wanted to get closer to this truth and see what I might find. Once I had decided that anything in my everyday life was potential subject matter, my days became infused with a new curiosity and constant observation. I experienced incredible joy in allowing myself to be fully present long enough to capture an image in minute detail. I became enamored with the practice of painstaking drawing. It could be something as mundane as a pile of laundry, or as beautiful as a rose blooming in my garden. I began noticing spider webs and mushrooms, birds nests and clouds, and I couldn’t wait to draw them. I began thinking more deeply about the people I love, and the kaleidoscope of color and imagery that each person conjures for me. Everyday routines like reading to my son at bedtime became as precious and important as recording events like birthdays and holidays. I gave myself permission to explore both humor and sentimentality, allowing the cute and the silly to sit comfortably with more serious and even melancholy themes. This attitude of openness and curiosity brought a new breadth and richness to the playing field of my work, where all emotions and all parts of myself were allowed to play. As daily observation became an habitual practice, I found myself more able to enjoy being in the present moment, rather than constantly fixating on the past or worrying about the future. At the same time, however, I continued to explore my long time interest in the role of memory in image-making. A close observation of the present often brings with it vivid memories of the past. 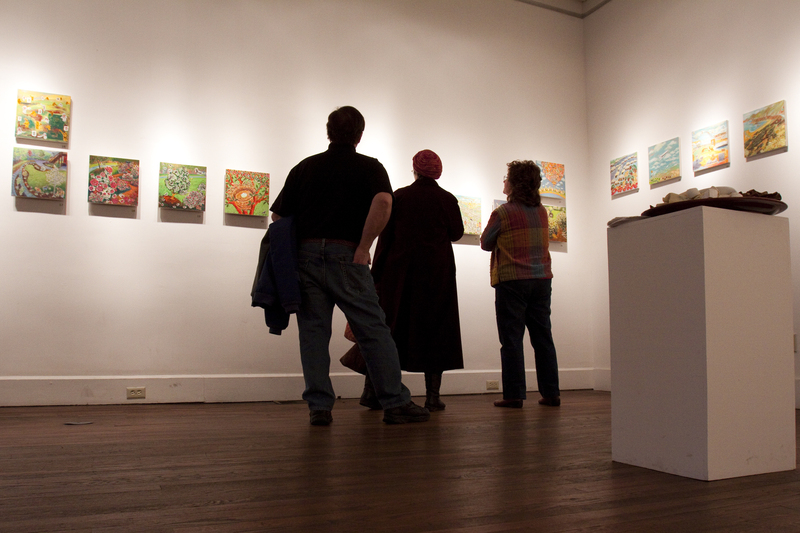 Allowing themes from the past to bubble up into my work enriched my experience of the present. 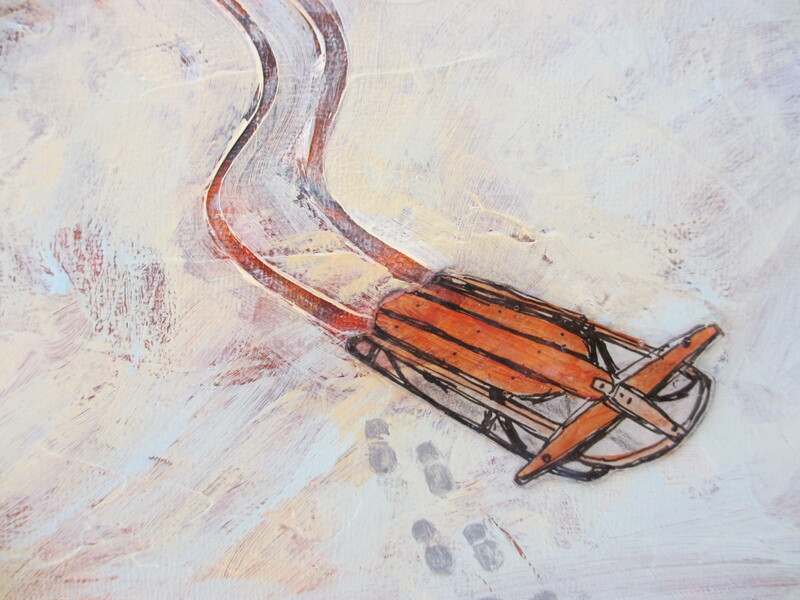 Images from my childhood surfaced throughout the year, and took a place right beside the images of our present life: my sled and my son’s sled, my childhood home and our home now, my late mother and my own motherhood, and of course, the Christmas ornaments that each tell a story from a different time. Similarly, images of the future were conjured: the black gum grows big enough to hold the swing I dream of having for my grandchildren, and the fantasy of a hot air balloon ride in July becomes a reality in December. I extended my attitude of openness and inclusion to stylistic choices as well. I allowed myself to make things that I enjoy making, freely combining aesthetics from such divergent genres as scrap-booking, painting, design, and children’s book illustration. It was important for me to break down those divisions and allow all of my influences to come together in my own way. 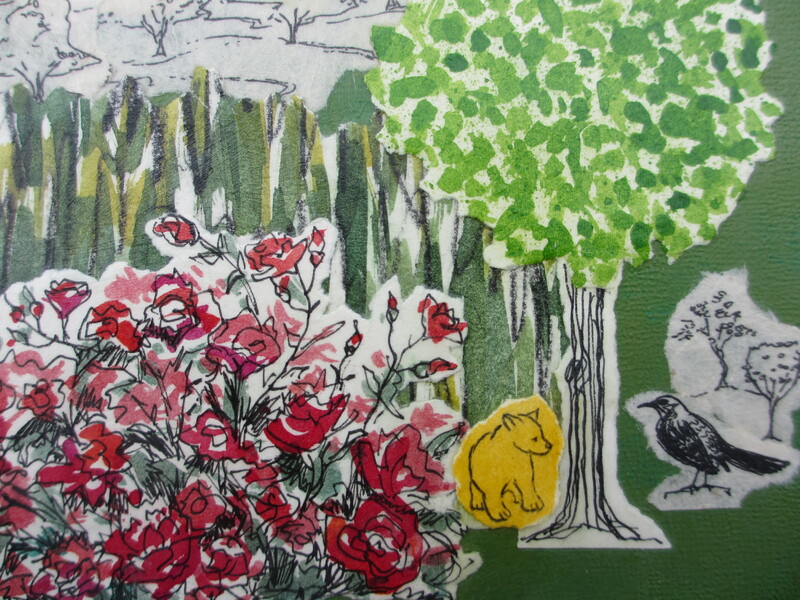 I embraced my love of picture-making, inspired by such diverse influences as Islamic Miniatures, 14th century Sienese painting, Bonnard and Vuillard, Miró, Bemelmans, and E. H. Shepard’s original illustrations for Winnie the Pooh. Collage was the best medium for me to explore the layering of diverse imagery and multiple techniques, fusing the parts into a unique whole. Grid installation in the studio. The most dramatic change over the course of the project was my idea of how the finished piece would look as a whole, and how it would be presented. 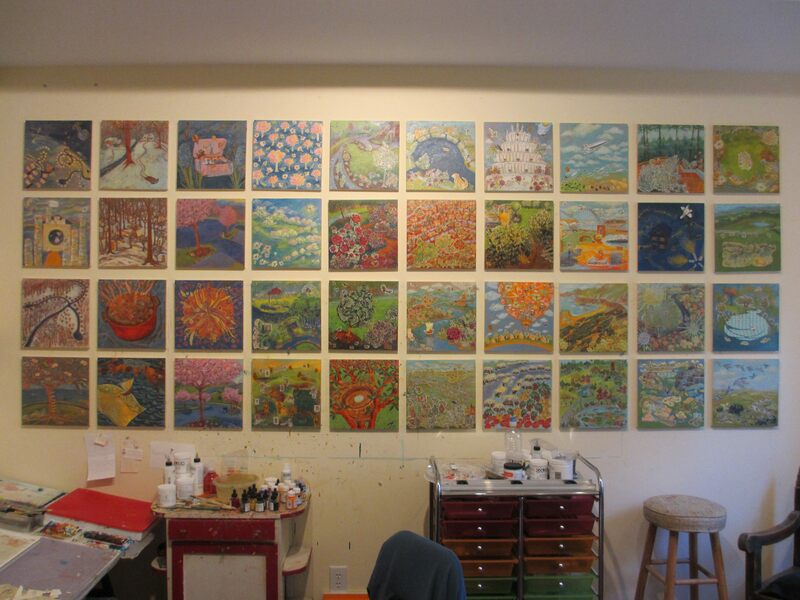 My original intention was that the 12 x 12 inch panels would be displayed in a large grid, four panels high and thirteen panels across. I planned on a tightly controlled palette that would read as vertical bands of color that changed with the seasons from left to right as the months progressed. But as I got deeper into the project, I began thinking less and less about the appearance of the panels all together. Each panel became its own intricate world, and I allowed myself to fall deeply down the rabbit hole of each work. Creative decisions were made more in service to the needs of each small panel, rather than forcing it to fit into the larger scheme of the grid. The imagery became so tiny and detailed, I realized that the top rows would not be sufficiently visible if displayed four panels high! 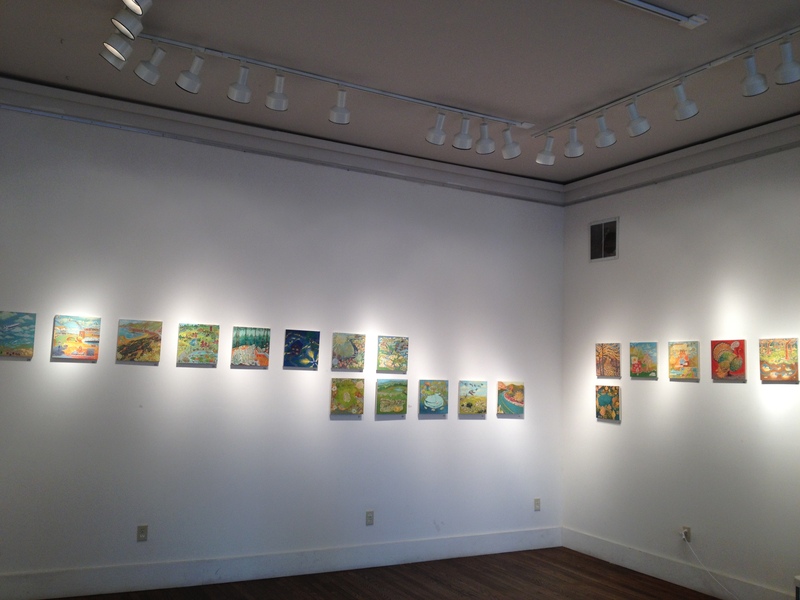 Each work begged to be seen close up and at eye level. 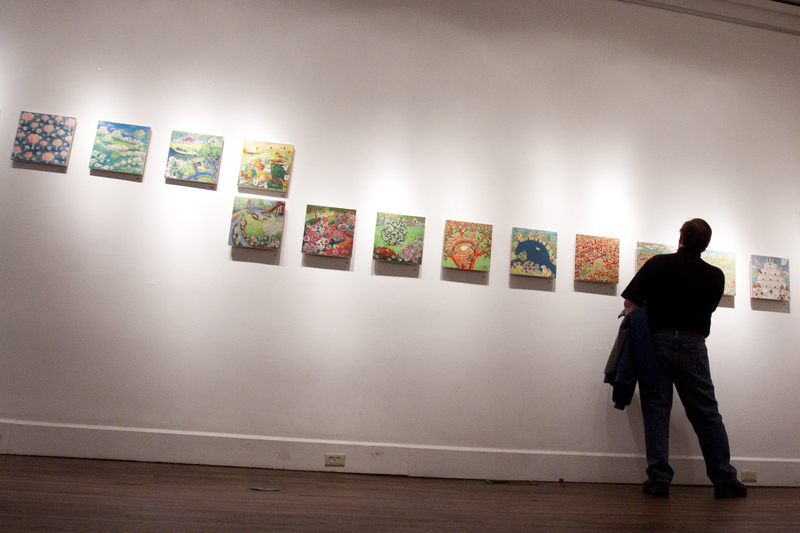 It became more about viewing each panel at close range and less about how the group appeared from a distance. 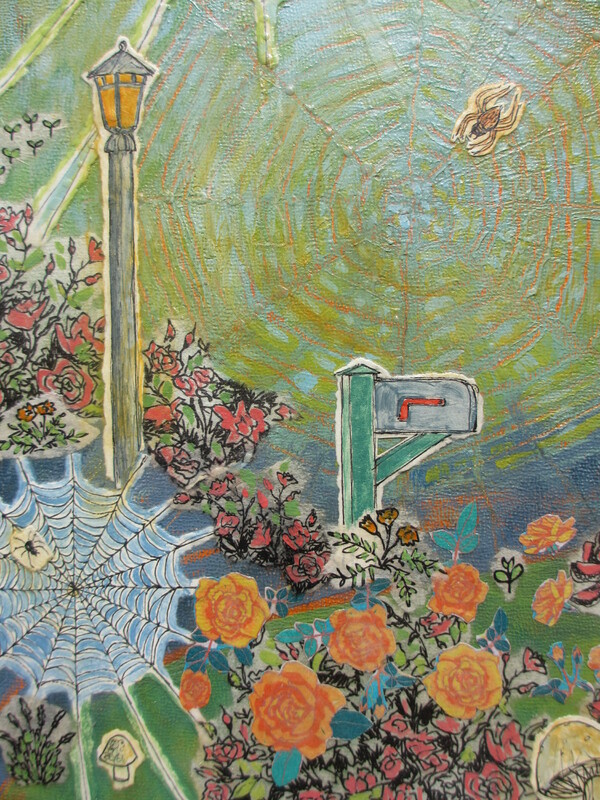 Detail, Holly’s Escape, Week 38. She makes many appearances in the collages throughout the year. While the concept of the giant grid fell by the wayside, new ideas about continuity emerged. I still thought of the 52 panels as essentially one large work that needed to be seen together, like a collection of short stories that could be read individually or even out-of-order, but would have the most impact when read from beginning to end. Visual motifs emerged that would be repeated throughout the series: the Lego Spaceship, our dog Holly and Olivia the cat, the mockingbirds, the wild geese, the dogwoods and the rose bushes, my husband and child. I found different ways to make the individual panels relate, connect, and lead the viewer through the narrative, by repeating motifs, extending color palettes across multiple panels, or by using the same textures or collage materials multiple times throughout the series. Whether displayed in a grid, hung in small groups, or spaced out singly along a wall, the fifty-two collages tell a story that reveals itself slowly, over time. When I look at the panels all together, I quite literally see a year of my life. I see my child growing up and my life evolving. I see moments that I will never experience again. I feel grateful that I have managed to “capture” this year of my life, and yet I also feel more able to accept the passing of time. I know exactly how long a year lasts, in a way I did not know before. 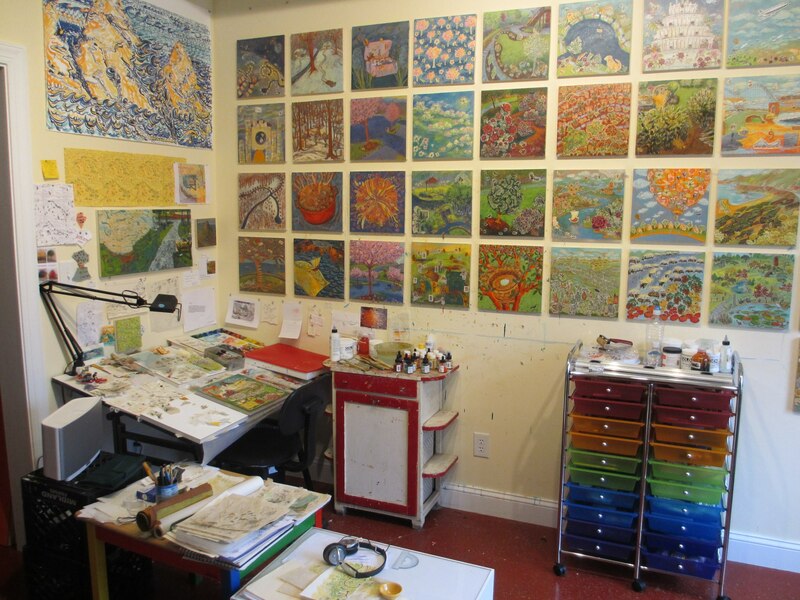 I know how many hours of art-making can be gleaned from seven days. I know how the seconds pass when the tiny point of a pen touches the paper, stretching into hours and days, weeks and months, square foot upon square foot, adding up to a whole that is larger than the sum of its parts. I have reached the end of this journey, and my 52nd collage is complete. For this final work in the series, I decided to pull together some of my favorite imagery from throughout the year, and create an essential distillation of My Suburban Life. This is my place and the things that I treasure. 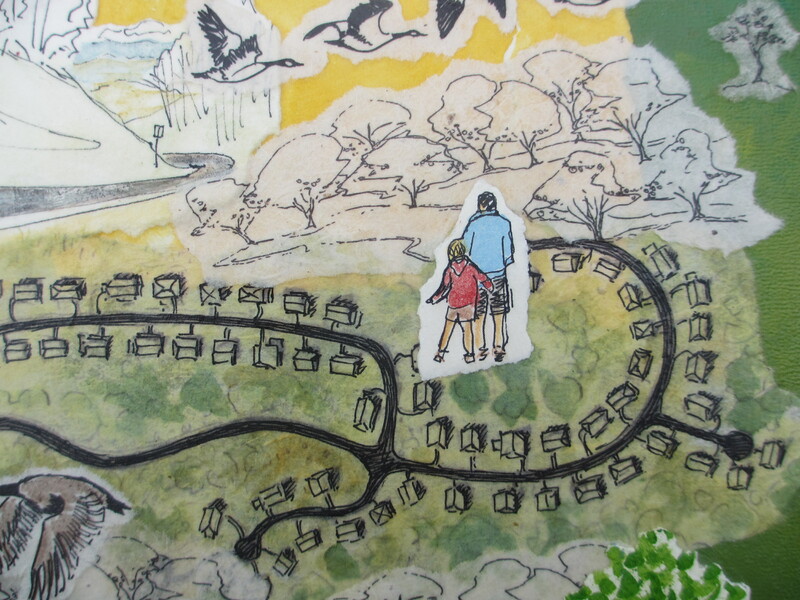 There is the map of the neighborhood, and images of the surrounding landscape where we live. 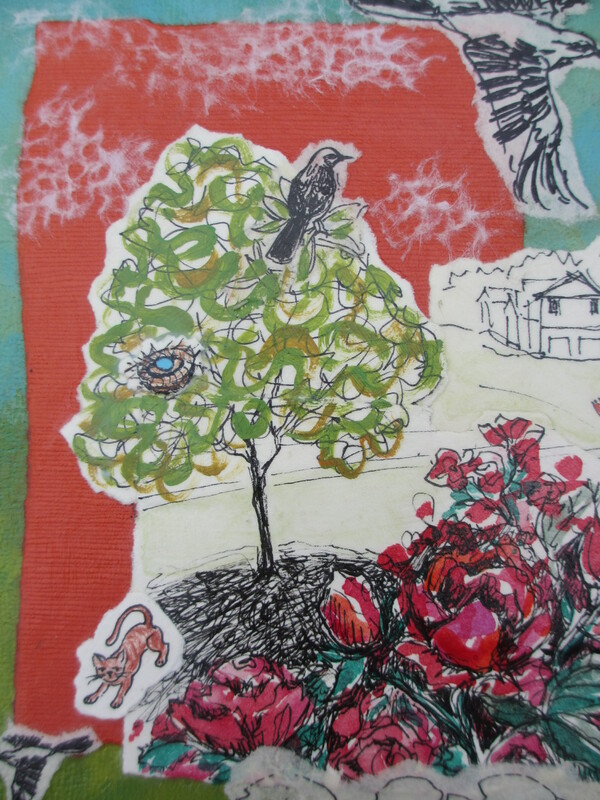 I included the dogwoods, the rose bushes, and the pear tree in the front yard where the mockingbirds sing. The wild geese fly overhead, while seedlings sprout in the garden. 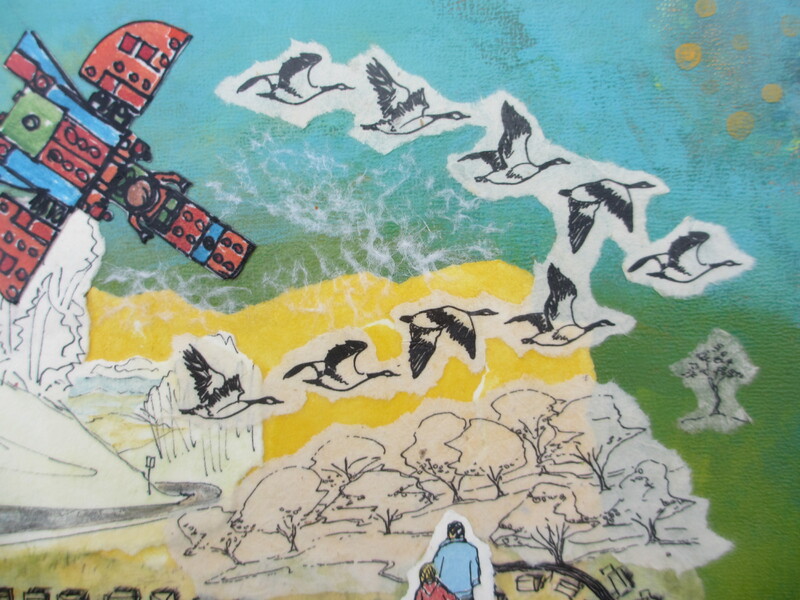 There are themes of growth and flight, both appropriate metaphors for the work of the past year. My husband and son walk close by while I lean over my drawing board, secure in my place in the world, my love of creating, and my commitment to my work. This is a very different feeling from when I began the project, with that strange ambivalence and unease of living in the ‘burbs. Now things are different. I have not only made peace with my suburbia, I have made it my own. My identity as an artist is not defined by where I live, but how I live a creative life. The Lego Spaceship was featured in the very first collage, and makes a final appearance here as well. This was from a small drawing that I made back in January 2012, when I first began the project, and had saved to use in a future work. Ever since my son Max flew his Lego Spaceship into my studio last January, it became a symbol of Art meeting Life. The spaceship hovers above the earth in the realm of the imagination, while simultaneously being a tangible domestic object, embedded in the material world. This magical child-like ability to bridge the gap between imagination and reality became my inspiration. My previous body of work had conspicuously avoided the realities of everyday life, preferring the escapism of imaginary lands. One year ago I asked new questions: Can I come down from my Ivory Tower and welcome the Lego Spaceship into my creative domain? Can I take the stuff of everyday life and transform it into art? Can I move freely between those two realms, with an openness and receptivity to both my own imagination and the intricate details of My Suburban Life? These questions led me to a place of greater awareness and compassion towards myself and my world, while continuing to challenge me to strive towards my best, most authentic work. 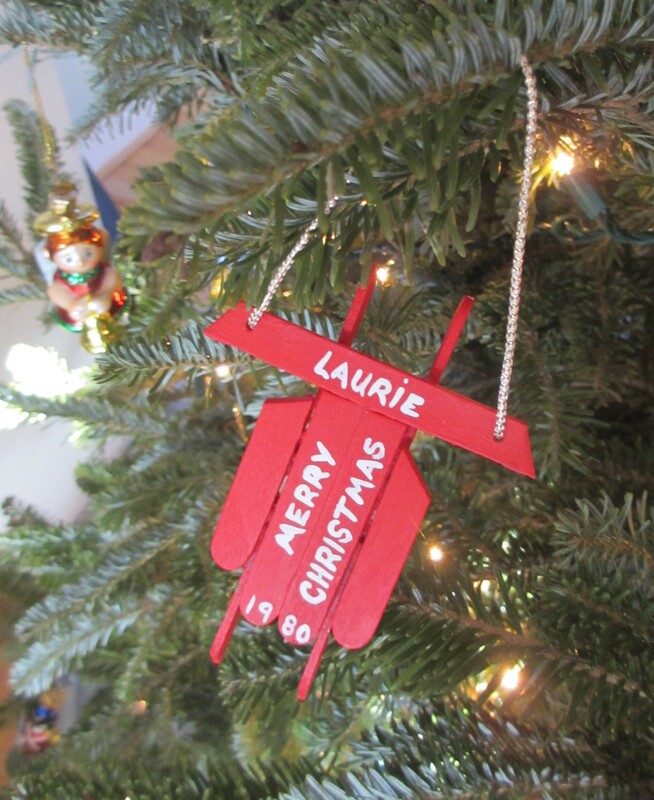 Sled ornament from my childhood. Every year I look forward to unpacking the Christmas ornaments and decorating the tree. My family likes to pick out a large fir that goes from floor to ceiling and festively commands the room. 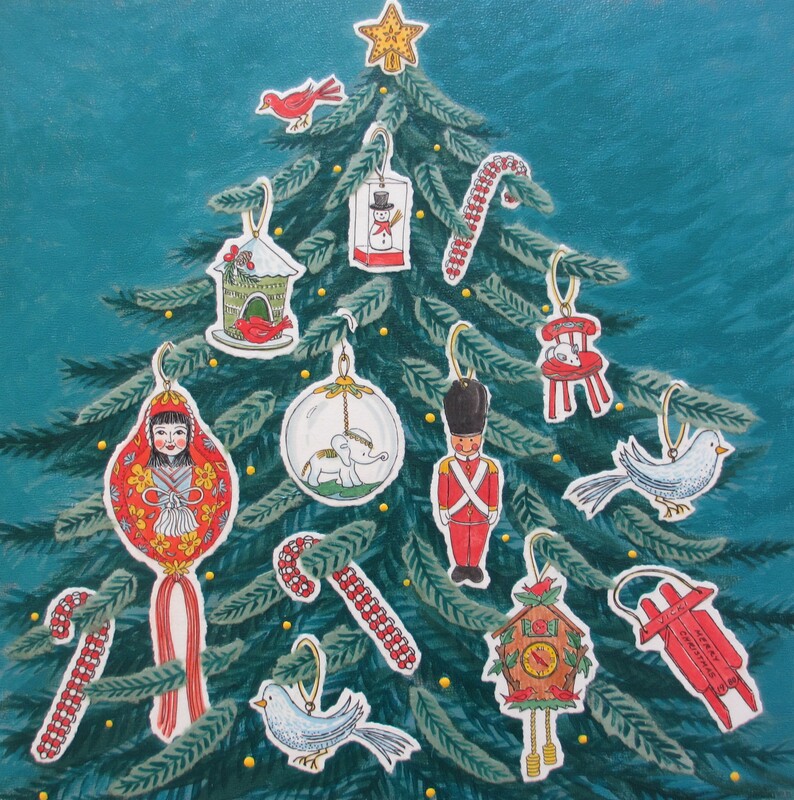 As I place each ornament on the tree, it whispers a story to me. Some ornaments are thirty something years old and come from my childhood, while others are even older and belonged to my parents. The newer ones remind me of our newlywed years, or when my son was a baby. 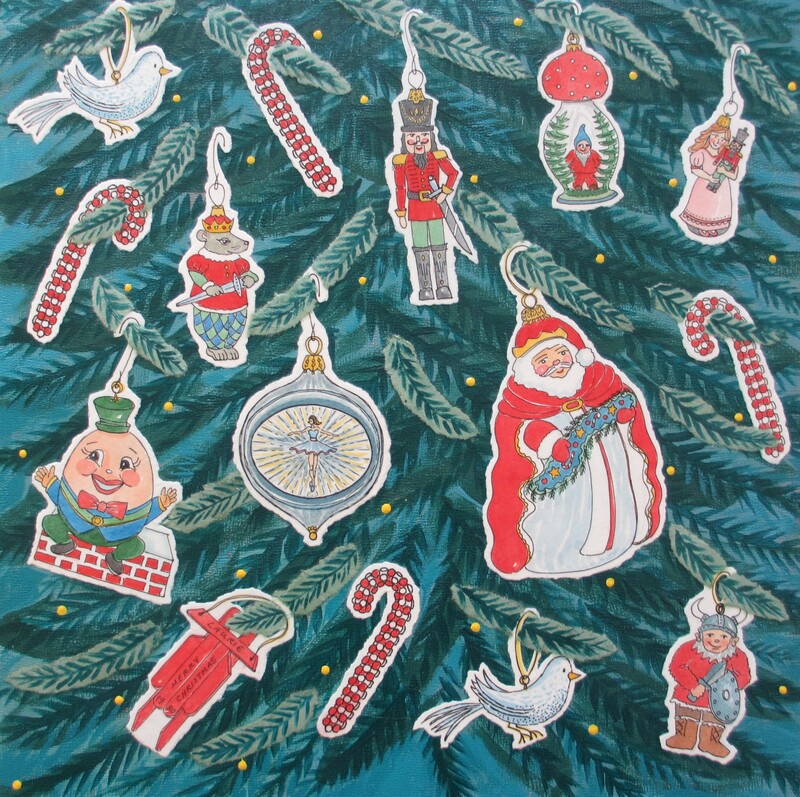 Each one represents a time and place that is conjured up again every Christmas. The tree becomes a shimmering display of memories that dangle amidst the evergreen boughs and twinkle lights. I enjoy the Christmas tree so much that I decided to dedicate two collage panels to this subject, displayed vertically one on top of the other. 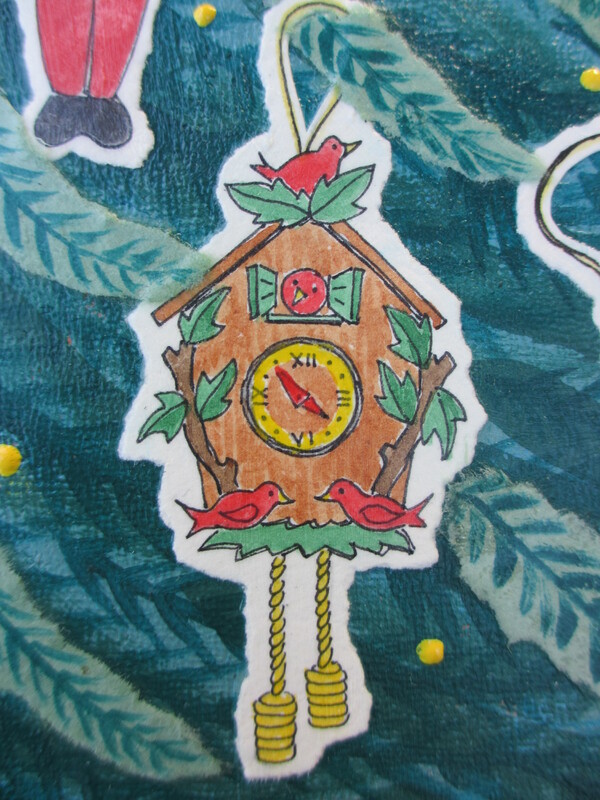 The ornaments in the collages were drawn from observation of our actual ornaments. A few were refurbished or re-created in the drawings to honor those favorites that were lost or broken. Most are from my childhood. 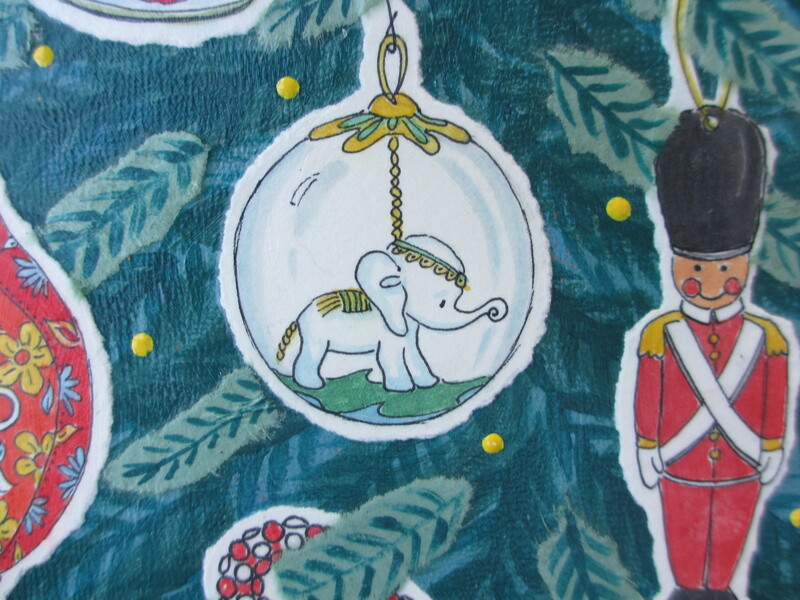 There is a little white elephant who once lived inside a clear globe. One year the glass broke, while the elephant survived. Here I placed him back inside his protective bubble. 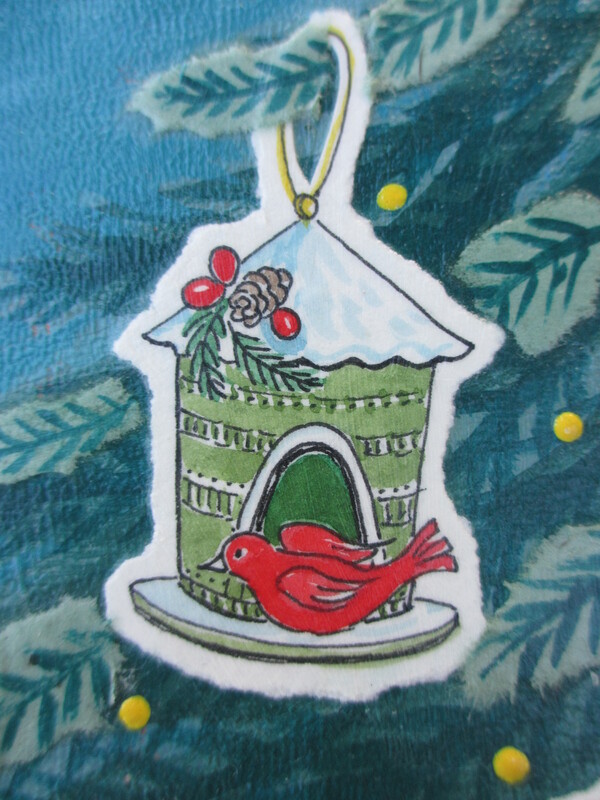 There is a tiny snowman, a mouse on a red chair, a bird house, a cuckoo clock, and sparkly silver birds. 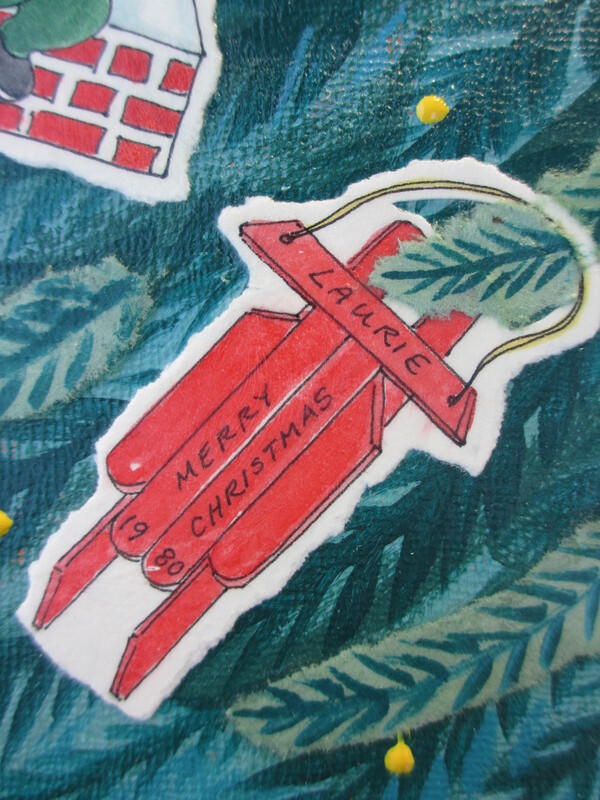 There are red wooden sleds with the childhood nicknames of my sister and I carefully painted in white lettering, with a holiday greeting and the year 1980. I was nine, and Vicki was eleven. 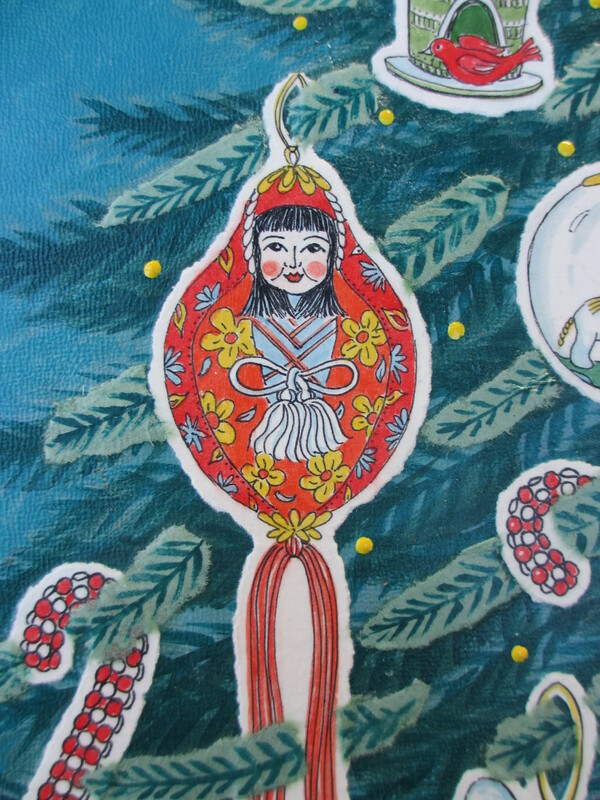 There is a gnome hiding amongst evergreens in a glass mushroom, a flat wooden soldier, and a beautiful Japanese Girl with a satiny red dress and silky tassels. My childhood favorite was a plastic Humpty Dumpty, dapperly dressed and sitting on a brick wall, grinning gaily, his hands in the air. 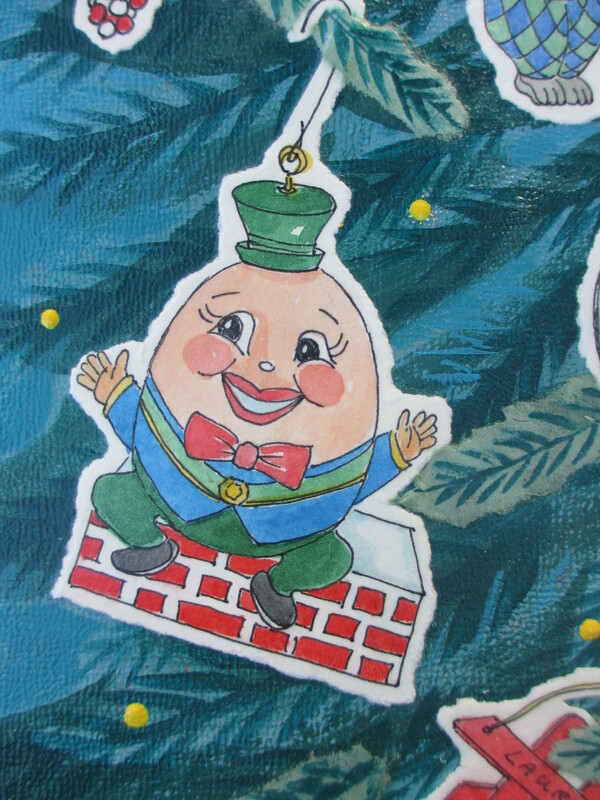 While he might seem somewhat incongruous amongst the more traditionally themed Christmas ornaments, for me, it was Humpty who best expressed the joy of the season. My mother had a special silver globe with a ballet dancer inside, and faceted mirrors that reflected the ruffles of the tiny tutu. Sadly, this treasured ornament was lost in a move, and I’m still not sure what happened to it. In the collage, I was able to bring it back. 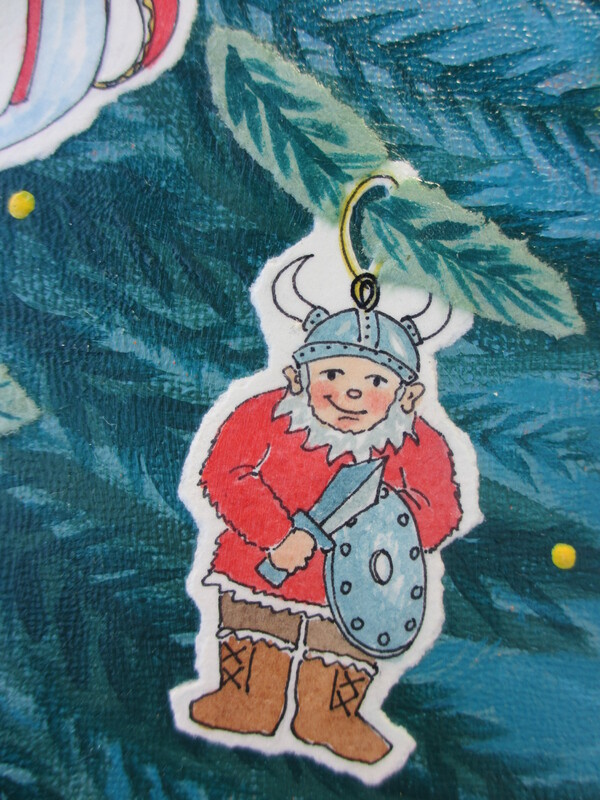 Another lost ornament was my husband’s childhood favorite, a stout little Viking man with a shield and sword. We don’t know what fate befell him. He too makes a come-back in the collage. Since he was lost before my husband and I met, I never saw the Viking, so my drawing is based entirely on Ken’s descriptions and my own imaginative conjecture. 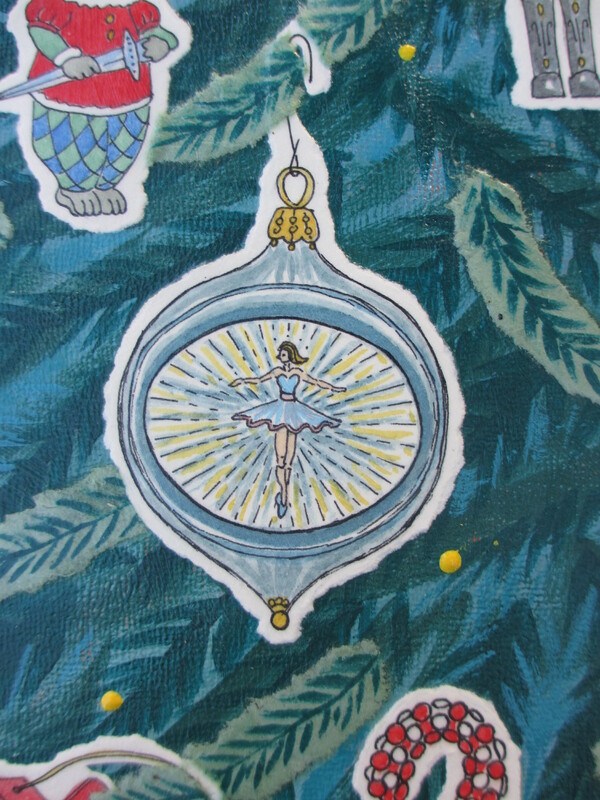 When we were first married, a dear family friend gave us a beautiful set of painted glass ornaments that included characters from The Nutcracker and other Christmas stories. These became very special to us. We had gone to see The Nutcracker performed by the San Francisco Ballet on Christmas Eve of 1999, the day before my husband proposed to me. 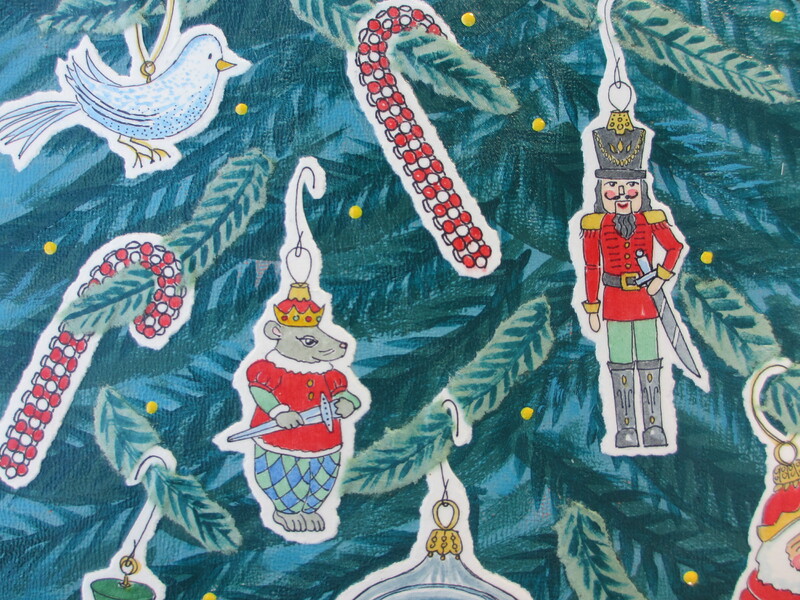 I remember that experience each time I hang Clara, the Nutcracker, and the Mouse King on the tree. 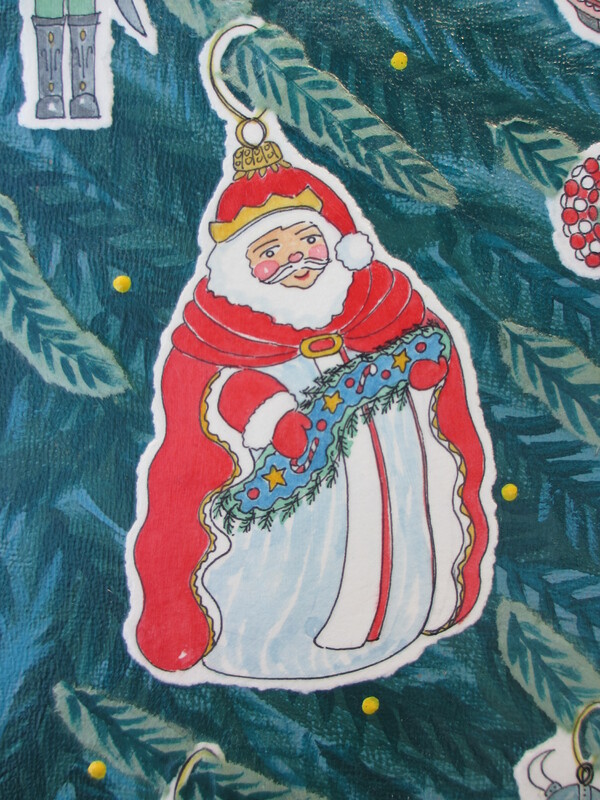 Another favorite from this same ornament set is a kindly Santa Claus wearing an elegant red cape and holding an evergreen garland. He’s one of the larger ornaments and always gets a prominent place on the front of the tree. I asked my nine-year old son to pick out his favorite ornament so I could include it in the collage. He chose the bendable beaded candy canes which are fun and flexible, easy to hang, and impossible to break. A wonderful choice! He can enjoy these for many years to come. 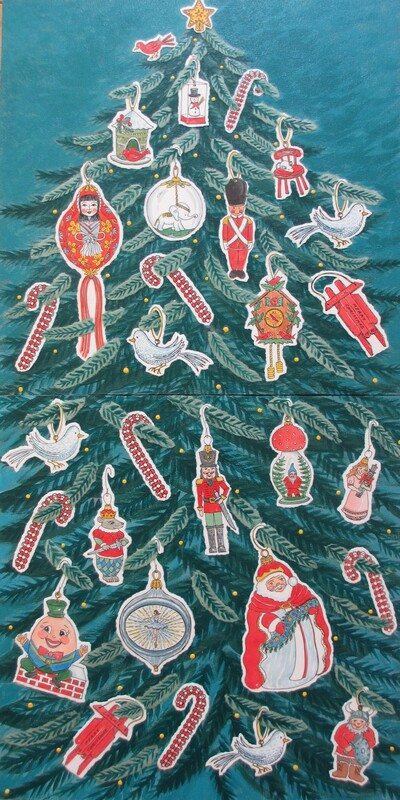 The practice of drawing the ornaments was very painstaking. I fell deep into the process of observing every detail, noticing both the perfection and the flaws, the sparkly sheen and the dulling of age. Some are quite fragile, or near falling apart. Some will break one day in the future. Creating the collage was a way for me to preserve the ornaments and the halo of memory that surrounds each one. At the same time, there is something about loving them fully and completely through the process of drawing that will allow me to let go when the time comes. I surprised my husband with a hot air balloon ride for his 40th Birthday. The wind was perfect that day. While we rose out of a field in the middle of town amongst strip malls and subdivisions, we floated across the highway to the Northwest, and soon found ourselves hovering above woods, farmland, and the Rivanna River, with the Blue Ridge Mountains anchoring the Western horizon. The colorful autumn leaves had fallen, but the winter landscape had a magic all its own. The bare deciduous branches appeared white and lacy from above, transparent screens that revealed layers of fields and forest floor. The dense stands of evergreens framed the open spaces of pasture, and the river carved its way through the landscape, reflecting a clear blue sky. The balloon ride felt like a big adventure when we first took off, but once air-born, the adrenalin subsided and there was simply peace, quiet, beauty, and the love between two people. The whoosh of the gas flame was the only sound. The world appeared as a miniature train garden, every piece arranged just so. I loved the winter palette of ochres, blue-grays, and deep greens, displayed in so many different textures. 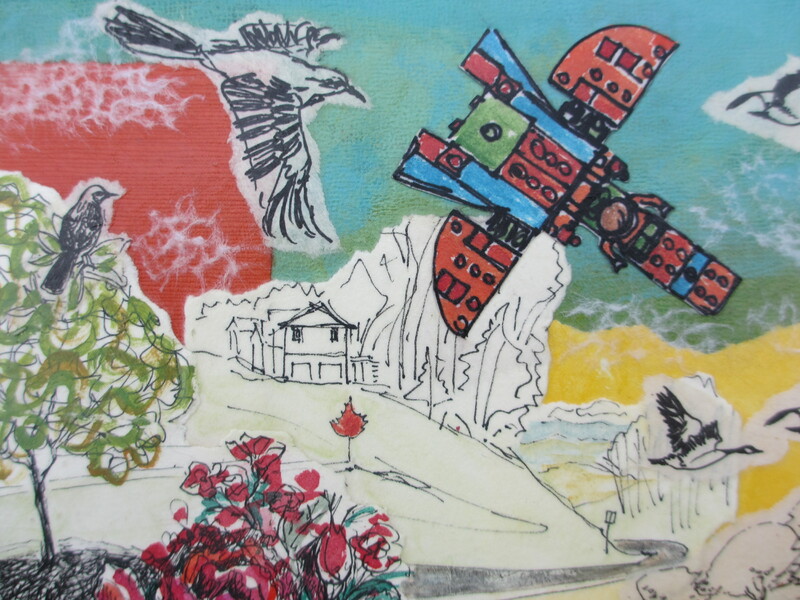 When I began working on the collage, I was enthralled with the task of drawing the tiny details I observed in the landscape, while at the same time trying to capture the whole experience of floating above the panorama. 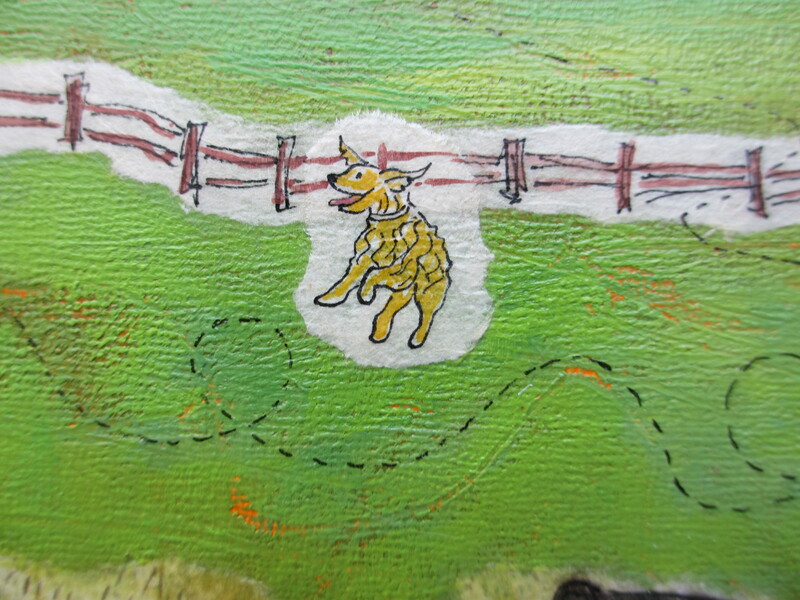 I combined small drawings of trees and farms with broader painted areas of river and landscape. Drawing and painting, line and color, detail and whole, all come together here with wonder and joy. 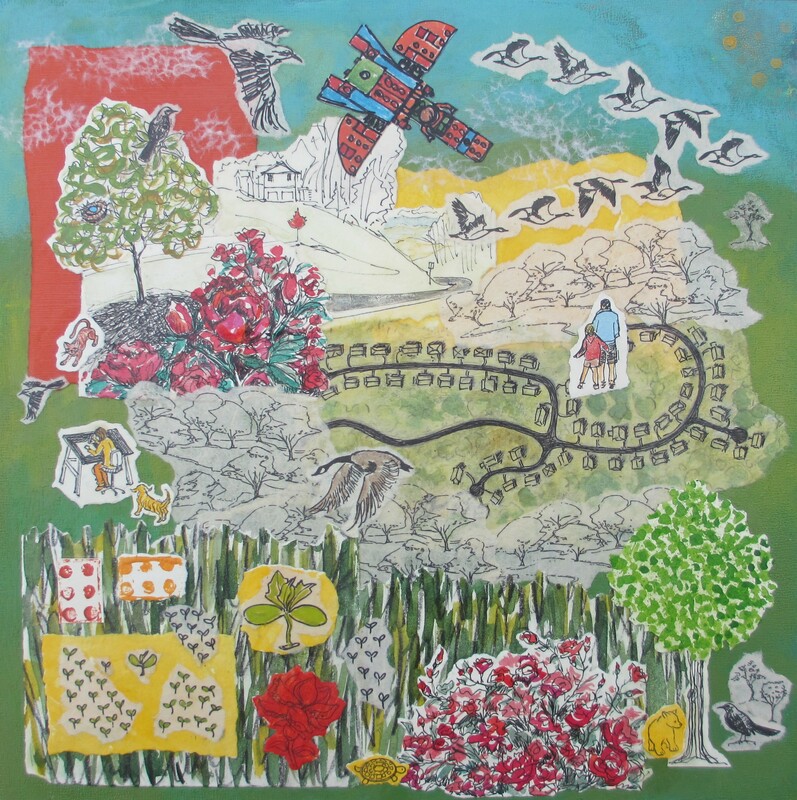 Balloon Ride, acrylic collage, 12 x 12 in. Welcome to the My Suburban Life archive site, which chronicles my year-long collage-a-week project from 2012. In completing this project, I learned what is achievable in tiny increments over time, by committing to small consistent actions and an attitude of openness to what is here, now, in the present. All images and text Copyright Laura Wooten unless otherwise noted.